If you are looking for a very hardy, drought tolerant landscaping tree then Malus or ‘Crabapple’ varieties could be the answer. They are available as standards and weeping varieties, mostly grafted as 6 ft (2 metre) so check the varieties on offer from listed wholesalers. 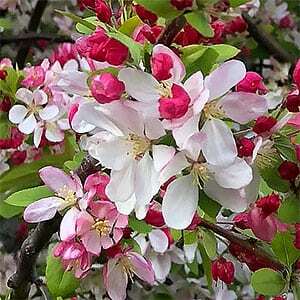 A wonderful flowering ornamental tree Crabapple trees make an excellent feature tree in the garden as well as a good small shade tree. Very hardy once established and available in a number of varieties including both single and double flowering types. 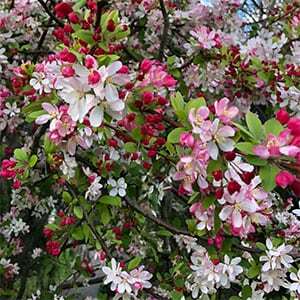 Although Malus ionensis ‘Plena’ or ‘Prairie Crabapple’ is the most widely used variety a number of others are also worth considering. Plants are available both as potted specimens as well as bare rooted plants during winter dormancy. M. etchermeyer – A weeping variety with large purple to pink flowers in spring, an excellent feature tree. M. Wandins Pride – This is a weeping crabapple, flowers and fruit. M. Gorgeous – Hardy, easy care, beautiful pink flowers followed by fruit. M. ‘Profussion’ – Red flowering variety.